My children have always been homeschooled, so they don’t know the realities of a traditional ‘school’ setting, although Phil and I often tell them about it (both the good and the bad). 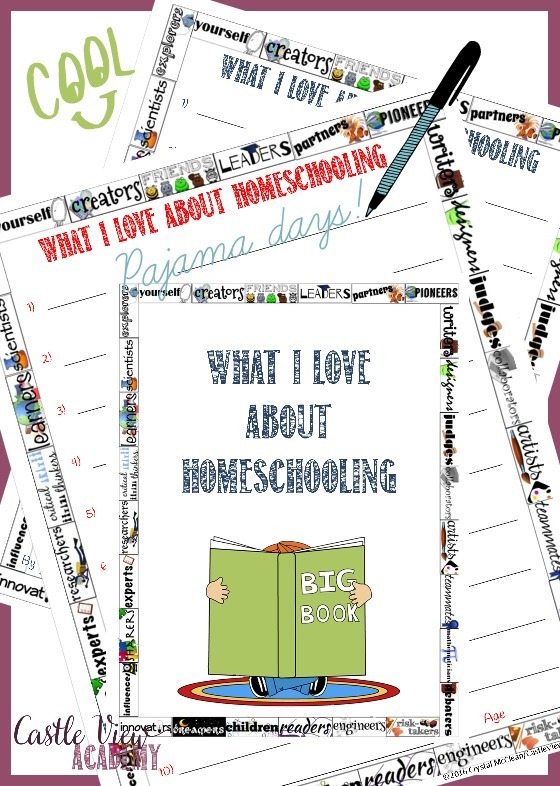 I know there are so many things that I love about the homeschooling life, and I thought it would be interesting for the children to write down what they love about their homeschooling experiences. Today I’m sharing Kallista’s project, Things I love about Homeschooling, from the perspective of a 5-year-old. 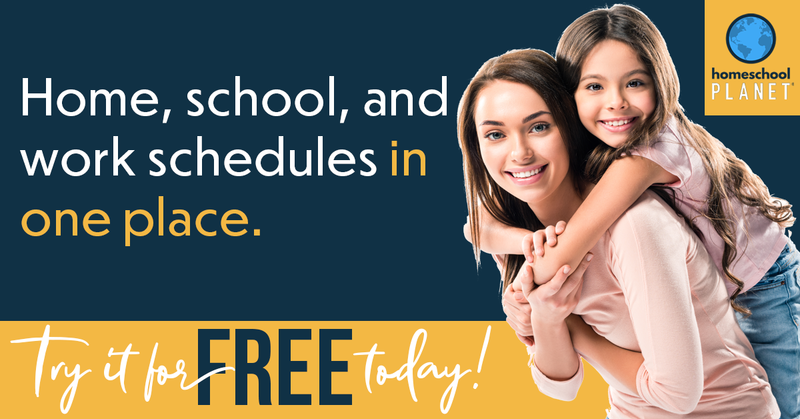 This project was inspired by Kallista seeing Desparate Homeschoolers 5 Days of Tips for Homeschool Parents….from Homeschool Kids! – Day 4 and she wanted me to make her a pretty printable so that she could have her own list to keep in her homeschooling treasure box. Of course I had to oblige and if you’d like to download your own copy, please click on the graphic above to access your own copy (you’ll have 4 colour choices to choose from. So without further ado, here is Kallista’s list, from the perspective of a five-year-old. I don’t have to walk to school myself. I get more playtime than kids do at school. I get to see my family more. I get homework on the computer. I don’t have to walk to school in the hail and miserable rain. I don’t have to do school on my birthday. I like fun pajama days. I like riding my bike with Dad. We don’t have to do homework when the other kids do. We can go to work with Daddy for breakfast when he has a day off. Kallista exceeded a list of 10, but that’s okay with me! It’s so interesting to see what things a young child values. Now that I know what is important to Kallista, I’ll be able to use some of the items on this list to make sure I keep the homeschooling life fun for her. 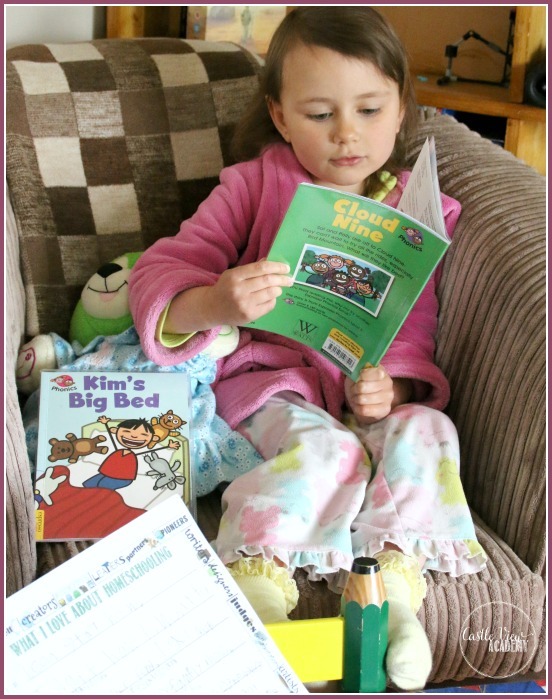 Kallista would love to hear what other children enjoy about home education and the homeschooling life. Please share your children’s perspectives in the comments! 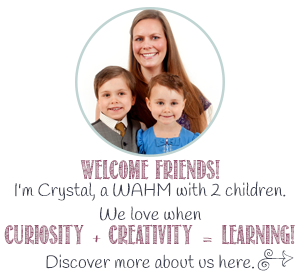 Today’s post fit in nicely with a monthly collaboration of Canadian homeschoolers who write about a different topic each month. 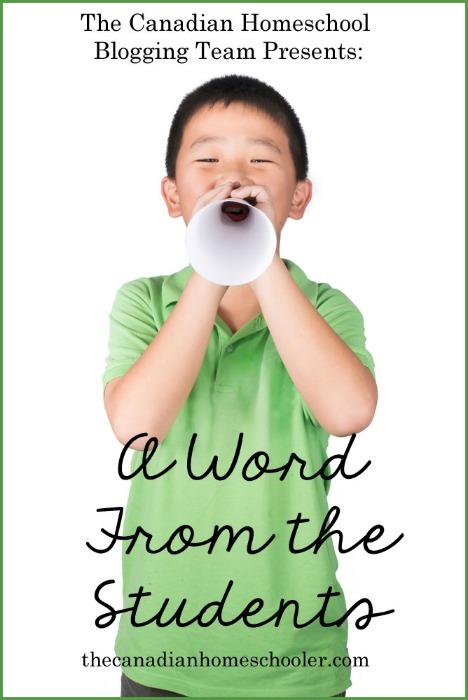 You can find more ‘Words From The Students’ at The Canadian Homeschooler where all of this month’s links are compiled. I just asked my kids what their number one favorite thing about homeschooling is to write down as it’s the end of the “school” year. My 9 yr old son said his favorite thing is more time with his family and choosing what he wants to learn. My 5 year old daughter said cuddling with her family and playing with her friends. 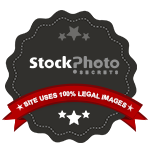 I love to hear what they value as well! That’s fantastic! These days when so many children spend so much time out of the home, it’s really truly wonderful to have a strong family bond. Tell Kallista she is a great thinker and I enjoyed her post and reasoning. Excellent! What an awesome list! My kids agree with all of Kallista’s reasons to love homeschooling, and I do as well. It’s such a wonderful way of learning! It’s so different than school, and there are so many ways available for us to teach and the kids to learn. Today’s a good day for us with multiple approaches – even though I’m down with a mean cold, they’re using their own initiative to keep learning 🙂 In fact – I think they’re doing better than usual today – maybe I should spend more days in bed! One of my pluses for home ed today: I don’t have to walk to the school at different times for the kids, I can stay low and re-couperate. I love #12. It’s so difficult to keep kids engaged at school so I applaud the fact that your teaching has kept your children loving learning. Keeping kids safe at home and helping them enjoy the zest for class is the best way to ensure their future success. Loved this post. Thanks so much! Sometimes being responsible for another human being is a tough task, but it’s nice to know sometimes that we’re doing a good job in their eyes.